I Want To Visit Jackson! It seems like I keep adding more places to my places-to-visit list, much faster than I can check any off! I just keep finding areas that look like the perfect vacation spot, or have a really unique draw. Most of the areas on my list are not cities or big, flashy tourist spots. I prefer an outdoorsy kind of vacation, where I can go hiking, horseback riding, four-wheeling, and maybe even some mountain climbing, skiing, or canoeing. If I can go outdoors and breathe some fresh air, get some exercise, and enjoy the beauty of creation, I am happy! So, after hearing about Jackson, WY and doing a little research myself, I have added it to my list! Of course, being the planner that I am, I have already looked at lodging options, and checked out hotels in Jackson WY. The reasons for visiting Jackson, Wyoming are too numerous to list, but one thing that quickly had me wanting to plan a vacation there is the sheer beauty and majesty of the area. You're right at the Teton Mountains, and the Grand Teton National park offers so many activities to enjoy! Hundreds of miles of hiking trails, mountain climbing experiences for people of all skill levels, and canoeing and biking are also allowed. Talk about some great photography opportunities! One thing I would have to do if I visited Jackson, WY is to take in one of the sleigh rides. Talk about an amazing, never-to-forget experience! You can even take a sleigh ride through the elk refuge, and see some gorgeous animals up close and personal. This is something you can't find at just any vacation site, so it definitely moved Jackson, WY up to the top of my list! One last thing I'll mention about Jackson is the Dogsledding. I have watched some movies, and read some books-but there are several companies in Jackson that allow you to actually become a dogsled driver! You can choose from a variety of trips; whether you're looking for just a one-hour trip, or want the full experience with an overnight dogsledding trip, you can find it all! This would be so awesome, and something to remember forever! If you've ever visited Jackson, WY or that area, please leave a comment with your thoughts, and what you recommend to do in the area! 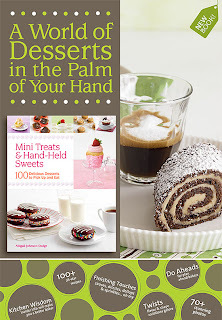 Mini Treats And Handheld Sweets Cookbook #Giveaway! Ahhh, I love baking! Coming up with a new treat for the family to enjoy, and adding a new recipe to my list of family-favorites. Recently, I had the opportunity to add several recipes to that collection, and I'm sure will be adding in more as I try more recipes from the newest addition to my cookbook shelf-Mini Treats and Handheld Sweets, by Abby Dodge. Just as the title indicates, this book is full of recipes for desserts that don't require utensils! When I received my copy of Mini Treats and Handheld Sweets, I browsed through and decided to flip over the corner of a page/recipe I wanted to try. Unfortunately, I think I ended up with well over half the pages turned down! Literally, trying to decide on just a couple recipes to make for this review, was very difficult! I decided to make the Peanut Butter Cone Cakes with Chocolate Frosting first, but turned them into cupcakes, since we didn't have any ice cream cones on hand. The directions were very easy to follow, and I would feel comfortable (and confident) letting the 12 and 15 year old make a recipe from this book. Every step is laid out clearly, and provides precise instructions. The cupcakes turned out perfect, and absolutely delicious! I was amazed at how quickly they disappeared from the kitchen...all the kids were wild about them! The next recipe I tried was the Carrot Cake Cupcakes. This was actually my first time making carrot cake, because only 3 of us eat carrot cake. However, it looked so good, and I really wanted some, so I went ahead and made them-besides, if less people eat it, that's more for me! :) These were awesome. Amazing. Delicious. Any good adjectives you can think of, that's what these carrot cake cupcakes are. Add some cream cheese frosting (recipe included) and you have the ultimate dessert! I also took a hint from Dino's (if you ever go to Branson, you absolutely have to visit his 24 Karrot Kake cafe at branson Landing) and added some whipped topping-this took the dessert from perfect to...well, I guess whatever is beyond perfect! Mini Treats and Handheld Sweets! As I mentioned in an earlier post, our family just left on an extended trip. We'll actually be gone a total of almost 3 weeks, so everyone is really excited! We have plans to visit with friends, visit some fun places (think Disney World, LegoLand...) and stay in some neat hotels. One thing I wish though, is that all our stops were closer to one area, because I really enjoy staying at the extended stay hotels. The extended stay Lubbock wouldn't work for this trip, but we will have to check it out on our trip to Texas towards the end of this year! There are several reasons why extended stay hotels are beneficial. First of all, they're designed for longer stays (obviously). This means most of them come equipped with a small kitchen, have laundry facilities on site, and offer a low cost alternative to staying at the normal hotel. Quite a few years ago, we took a trip to the Columbus, OH. area, and stayed at one of the extended stay hotels. I believe this was our first time at one of these, and I was really not prepared for how pleasant the stay was! I thought a hotel designed for longer stays would be pretty basic, and not quite as luxurious. Well, I was wrong. Extended stay hotels make your visit so much easier! With 8 people in our family, one of the biggest benefits is the ability to cook a real meal in the room. Usually a road trip for us means a lot of fast food (yuck!) and no home-cooked meals. I mean, you can't exactly microwave up a nice meal for 8 people! So, even though the kitchen in these hotels are usually a little smaller, they still provide ample room to cook up a meal. Another thing we enjoyed at the extended stay hotel was the ability to bring our pets in to the room. I'm not sure if all extended stay hotels allow this, but it was so nice to bring both our dogs up, and enjoy them while on vacation. Most times we have to find someone to leave them with, so it was very nice to have the family pets along with us on this trip. Let me know if you've every stayed at an extended stay hotel, and if so, how you liked it! Donate Cars To Help Veterans! There are many ways you can go about helping military veterans. You can do something as simple as saying thank-you whenever you see an armed forces personnel. It sounds so basic and small, yet will be gratefully received by most. You can take this a step further by helping out a veteran you may know (a neighbor, or maybe a friend). Invite them over for dinner; bake them a nice treat, or in the case of an older or injured vet, help out with some lawn work or household chores they may not be able to accomplish by themselves. Of course, there are also bigger ways you can help a veteran. I know I have mentioned it on here before, but there is one charity in particular, Vets Vehicles, that allows you to donate a vehicle for veterans. One thing I especially like about this place, is that they send all the money from the donation, directly to the charities! It's nice knowing that the money or whatever you're donating to a cause, is really being used to help! Quite a few years ago, our family was asked to provide some special music at a Church service when we were on a road trip to Texas. We are from from professional singers, but our family enjoys singing together, and we often will sing a couple songs for Church, or for other occasions such as visiting a nursing home, etc. Anyways, back to the Church service. As I said, we were in Texas; not at the Church Houston, but at another Church in a small city. We had pulled in early and everything went smoothly; the kids were all prepared, everything was set up, and we were ready to go. The Church service started with some congregational singing, and a few announcements were read before we were to be called up. About 10 minutes into the service though, suddenly the lights went out. And the air conditioning. And the sound system. Yep, the electric went out completely! So not only was it pretty dark in the Church (did I mention it was the evening service?) but we had to sing without mics. Not a huge deal, as we have done it before, but this was a pretty large Church, so we each had to be sure and sing out good and loud. And, because the lights were out, we couldn't have the lyrics there to read. Most of us are fine without them, but the younger children like having the lyrics nearby for a quick glance to remember their part. Amazingly enough, the entire process went well, with no slip-ups, no missed lines, and no complaints of "I couldn't hear what you were singing". In fact, we received several compliments afterwards-maybe we should sing in the dark (and without the mics) more often! Of course, as you would expect, the power was not turned back on until later in the evening, after the Church service was almost over. It was kind of fun though, and definitely a service we will always remember! Have you ever been to a unique Church service? Any service where something funny or strange happened? Please share your story! No, don't get worried friends-I am not planning a move to New Mexico in the near (or, as far as I know, the distant) future. However, while I am happy where we live right now, I do sometimes think about where I would like to settle if (and that is a big if) we ever decided to move. I have a few different areas/states that I really like, and would be at the top of my list if the time to move ever came. One of these, (and if anyone knows me, they already know this) is Texas. Don't know why, I just love the whole state! Then again, I enjoy certain parts of Tennessee. Gorgeous scenery, and pretty much middle ground as far as weather. Yet again, I really enjoy New Mexico! My first visit to New Mexico was less than 2 years ago, but from the moment I stepped foot in the state, I fell in love with it! So, Albuquerque Homes for Sale naturally catch my eye, and make me pause a moment or two to dream! See, the first thing about New Mexico that I like is that we have some really good friends there. Friends that, right now, we only get to see twice a year. Families we have met through various circumstances, and now we visit New Mexico once a year, and some of them come visit us once a year. When you're good friends though, twice a year just isn't enough! Another big draw for me is just the landscape, the scenery, and the general atmosphere of New Mexico. It is almost like stepping back into an old Western tv show; the dry desert areas, the cactus, adobe houses, and yes, the southwestern feel. There's nothing like mounting a horse, and taking a ride in New Mexico-it makes you feel like a cowgirl! I also like that there is so much New Mexico has to offer. Many sites and attractions (we're planning on visiting Carlsbad Caverns on our trip out there this year) that the whole family can enjoy. You could literally spend a lifetime there, and never run out of things to do! Have you ever been to New Mexico? If so, what did you like or dislike about it? Well, today our family left on an extended road trip. We will be gone for close to 3 weeks, and I will be including some really fun reviews and pictures from our trip, so be sure to keep an eye out! When preparing for the trip this past week, one of the biggest questions was "How do we keep our electronics charged?". When we're at a hotel for a few days it's no problem, but on the days that are mainly driving to our next destination...you get the idea. For example, today we left the house at 5:00 in the morning, and just pulled into a hotel. No chance to charge the phones, iPad, tablets, or other gadgets. Some of these devices will last an entire day, but others not so much. When all the kids enjoy playing games or reading books on the iPad, the battery runs out really fast! That's why it's important to make sure you have a portable charger of some sort for any device that gets drained fast, or receives a lot of use. I am beginning to think we should have purchased a couple different portable chargers, or add-on battery packs for some of our devices. As I mentioned, the iPad especially gets a lot of use, because everyone wants to read an e-book, or play Mad-Libs, Chess or one of their favorites, the Snoopy/Peanuts Village. After passing it between 2 or 3 of the children for a couple hours, the battery is pretty close to dead. Not to mention that when we stop for lunch or a restroom break, I like to check emails if they have WiFi. Our phones usually last pretty good, unless if somebody starts texting a friend, or if a certain few people call, who usually end up in a lengthy conversation! As you can see, portable chargers or portable power options are pretty close to being a necessity for our family when we're on a trip. What about you? Do you have a portable charger for your devices? Do you need one (or more) portable chargers and/or extra battery packs for any specific electronic? Share your thoughts! 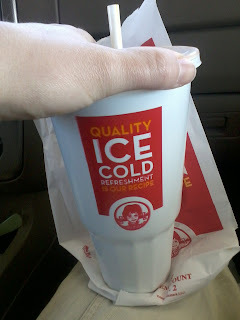 Wendy's is one of my favorite fast food restaurants-it is easily in my top 5 picks, probably even my top 3! I love how fresh the food tastes, compared to some other fast food options. When given the opportunity to choose between Wendy's and 2 other popular burger places, I always choose Wendy's. So, when I heard about the revamping of their value menu, I was both excited and curious-after all, I have some favorites on the value menu, and I didn't want them to disappear! Thankfully, my favorite on-the-go and low-cost burger, the Jr. Cheeseburger Deluxe, is still available at Wendy's for only .99 cents! You just can't beat that! 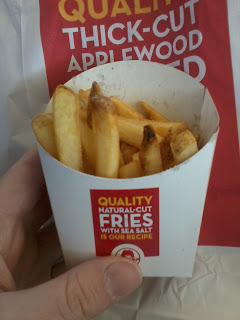 However, Wendy's sent me a $5.00 gift card to try out the new/revamped menu, so I decided to make a visit to our local Wendy's and try something different. After perusing the menu, I decided on the Grilled Chicken Go Wrap, which is a little more than the burger I usually buy, but I decided to go for it anyways. I added a value French Fry, and a large drink. No, the large drink isn't on the value menu, but when Wendy's has my all time favorite drink, a Diet Cherry Vanilla Dr. Pepper, a small just isn't enough! I think this is the first time I've had a chicken wrap at Wendy's, but it certainly won't be the last! The Grilled Chicken Go Wrap features a tender, moist grilled chicken fillet wrapped in a flour tortilla, and topped with lettuce, cheddar cheese, and a yummy honey mustard sauce. It. Is. Delicious. It is out-of-this-world good, and for only $1.89, it's a tasty and healthier choice while on the run! Of course, Wendy's french fries don't need any introduction or description-they're just the perfect accent to any burger or chicken! And, as I said, who can resist a Diet Cherry Vanilla Dr. Pepper? Definitely not me! $5.00 gives you a great meal at Wendy's, (or a little less if you're not like me, and need a larger drink :) and it's even good for you! 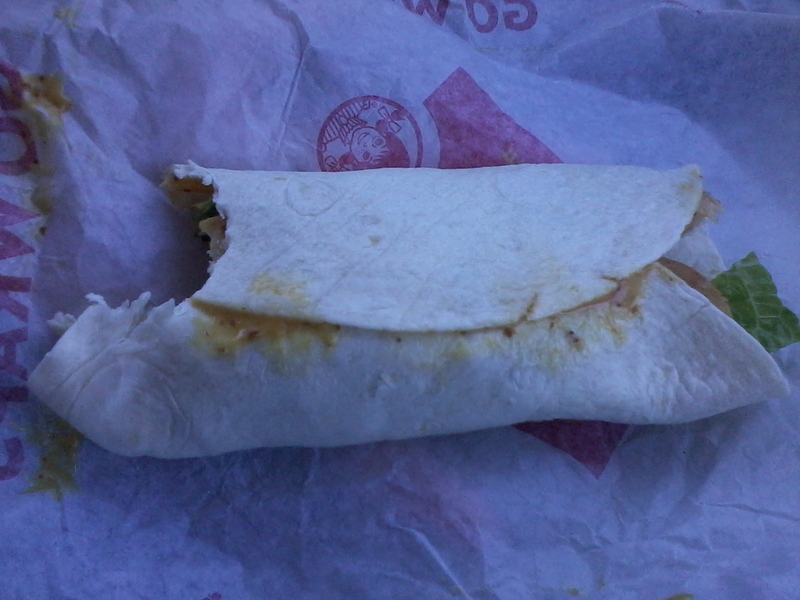 (At least the chicken wrap is; I could have opted for a healthier side like a garden salad, but I love Wendy's french fries!). One of my readers will receive a $5.00 Wendy's Gift Card!! Do any of my readers have a sign in their front yard? Something to add a decorative touch to the lawn, or maybe some humor as well? We do a lot of traveling, and one thing we enjoy is catching some funny signs in yards, and in front of businesses. Some times these are meant to be humorous, but we also get a laugh out of all the grammatical or spelling errors on signs! My mom was an English teacher, so that is one of my pet peeves-especially when you see a restaurant or some other place of business with a misspelled word, or totally incorrect grammar or punctuation on their sign! One of my all time favorite yard signs is the one about "I can make it to the fence in 2.8 seconds. Can You?" with a picture of a dog (usually something like a Rottweiler or German Shepherd) on it. I've actually thought about placing an order online to get one of these; it's a great way to let people know you have a guard dog, and have a laugh at the same time! Here is another guard-dog related sign that I thought was pretty funny too. 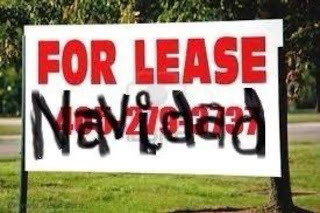 Here is another sign that someone who had a pretty good sense of humor came up with. Note: I do not condone vandalism or graffiti, I'm only sharing this for the humor. How about you? Have you seen any funny signs recently, in your hometown or maybe on a trip? Please feel free to share in the comments, as long as it's clean and family friendly! Are any of you looking to redecorate your home? Maybe you have something big in mind, or maybe you're looking to freshen up your home on a smaller scale; just a new color paint in the bedroom, or a new couch in the living room. We have been rearranging and redecorating our house slowly as we are able, and it's really looking good! A new piece of furniture here, and a different piece of art or shade of paint there. It's fun and makes our house more homey every day! So, back to my original question-are any of my readers working on getting their home renovated or decorated? If your answer is yes (or even if it isn't :) then you will definitely want to enter this giveaway!! I discovered Wall Murals from TotalWallCovering.com, and I was blown away by these. No matter what room you're looking to add some color or decor to, you can find the perfect piece! 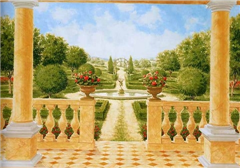 For example, I think one of the many beautiful landscape murals available would be perfect for the living room. We spend so much time in that room, playing games, relaxing, and just enjoying the family time, and it would be a great accent. There are so many to choose from, but I think the Northern Exposure is one of my favorites. 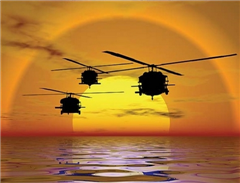 How awesome would this Helicopter Sunset mural look in the boys bedroom? It would especially thrill E, who has his heart set on being a pilot. Or, if you prefer something a little different. Landscapes not your thing? Then how about the Giardino All Italiano? I think this mural would be a perfect addition to the dining room; a touch of Italy while I'm dining on fettuccine alfredo or chicken parmigiana? Yes please! As you can see, there are murals to please anyone on TotalWallCovering.com! Whatever your tastes, and whatever room you need decorated, I recommend you visit TotalWallCovering. Or stay updated with them through Facebook, Twitter or even on Google+! 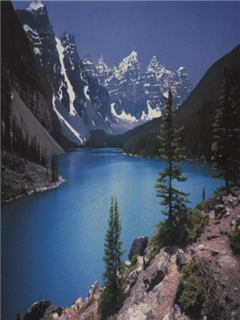 One of my readers will receive a Wall Mural! Hey, just another quick post about shaving tips and routines here-seems like it is quite a popular topic lately! Like I have said many times before, it's probably my least-favorite routine, but I do it a couple times a week. Oh, what we suffer through for smooth legs! Have any of you ever used a safety razor? My current favorite/most used manual razor is a refillable razor, and I usually purchase the triple-bladed safety blades for it. However, what I find myself reaching for more and more is my electric wet/dry shaver. There are pros and cons with it, but I think the benefits outweigh the drawbacks. The electric razor I have doesn't shave quite as close as the manual razor-the effect doesn't last as long before I need to shave again! However, it drastically reduces the time needed, so I usually prefer the faster option, even if it means doing it again just a few days later. Another way to make the shaving process easier is to be sure and get your skin good and wet beforehand. Even though I have a wet/dry shaver, I always use it in the shower! I found very quickly that letting some very warm water soak in softens the skin, and makes shaving easy and painless. Something else I learned early on is to change the blades on my refillable razor (or replace the disposable razor) often enough. Otherwise your razor/blades will get dull, or clogged and end up nicking your legs. The pain doesn't last long, but it is quite sharp while it's there! Lastly, and I can't mention it enough, is to apply a moisturizing product to your legs after shaving. Whether you use a hydrating lotion, or prefer something more natural like an oil (I've heard of people who use coconut oil, and say it works great), keeping your skin hydrated is key! Especially with the weather we're having right now (it was 9 degrees outside when I went to the grocery store earlier this week) I have found myself needing to moisturize my skin a couple times a day. Heelys Skate Shoes Are Fun! How many of you have ever seen a kid skating through the grocery store, in those neat skate shoes? I've seen them all over, and several times had the kids mention that they would be a lot of fun. I was rather leery though, because I've seen too many times where kids seem to totally ignore common sense, and almost crash into people, or just speed through a store without looking. But, when given the opportunity to review a pair of Heelys, I decided it would be a great test to see if: 1-they were as fun as they looked, and 2-if they were easy to control. I received the Womens Jogger shoes, in a pretty black and charcoal gray, with pink trim. Very feminine, yet they're not a color that will only match one outfit; you can pair them with just about anything. M and I wear the same size shoe (she's getting pretty close to my height too!) so I ordered a size that would work for us. M was pretty excited about getting to try skating in sneakers! When the Heelys arrived, I was surprised to learn a couple things. First, I never realized that you can wear the Heelys as regular shoes. To change them into "skate shoes" you have to pop out a piece from the heel, and insert the wheel. It's very simple and only takes a minute, but for some reason I just assumed these were used for the sole purpose of skate shoes! I like being able to take the wheels out though, if we're somewhere that the kids shouldn't be skating around, or just to throw on for running errands. Second, I was very pleased to learn that the Heelys are easy to control, and wearing Heelys doesn't mean that the children will just be skating into objects and people. It's very easy to get the hang of using Heelys. This was a big relief, because once the kids learned how to control the skating, apply the "brakes" and guide the wheels in the direction they're traveling, they can wear them out, have fun skating while out and about, but be able to control where they're going, too! Now, while you may think shoes that turn into skates are just for kids, think again! I had some fun wearing them, and Heelys really bring out the kid in anyone! Who doesn't love skating, right? Why not put that ability in your shoes, rather than bringing a pair of skates along everywhere?! These are super fun for when our family is taking walks at night (not so much in the 9-degree weather right now, but once it warms up again), bringing the kids to the park, or just to wear wherever you are. Be sure to visit Heelys on Facebook, or follow Heelys on Twitter and stay updated on any news or specials! Disclaimer: I was not monetarily compensated in any way for this review; I did receive product for the purpose of review. All thoughts and opinions are mine; all quotes taken from the Heelys website. I was not required to post favorably about the product or company. How About A Massage Chair?! Do you or anyone you know suffer from back pain? Back pain is something that seems all too common, and I know a lot of people that deal with it, wether it's an everyday thing, or just an occasional occurrence. A couple years ago, my mother had some swelling in her lower back, which turned into a hospital visit, and some serious prayer before we were able to find out exactly what the problem was, and how to deal with it. (Having a massage chair handy would have been wonderful to help soothe the pain). Back pain seems to be one of the worst kinds to deal with, because it affects so much. Unlike a toothache, headache, or even something like a broken arm-when your back hurts, pretty much every part of your body is affected. So, when it comes to preventing back pain, I am definitely in favor of learning everything I can! One thing I learned from my Dad many years ago-I can literally remember him telling me when I was about 5 or 6-is to never bend over to pick something up. Anytime I would bend over to grab something, he would say "squat down to pick it up-you'll save your back". Of course, as a kid, I never thought that much about it, but followed his instructions anyways. Now, I'm grateful that it's become a habit; if I need to pick up something lower down, I squat, rather than bend over. Another back-health tip I learned from my parents was to always sit (and stand) up straight. No slouching was allowed when I was growing up; I had to sit up properly, and again, this is something I still do, and now appreciate the benefits of doing so! One other way to help prevent back pain, is by doing a stretching routine and some back-targeting strengthening exercises every week. I recently started doing a few minutes of pilates every other day, and have really enjoyed the stretching that is so healthy for your body. Additionally, I use resistance bands and kettlebells for some exercises that target the back, and help strengthen it. It's a great way to prevent injury or pain, and ensure you have a strong back! What about you? Do you do anything to help prevent back pain? Are there exercises you especially enjoy to strengthen your back? Please share! Our family plays a lot of racquetball. On average, you can find us on the courts at our local YMCA at least 2-3 times a week. However, for the past few months M has been begging us to take her to play tennis. After some research, I found a park not too far away that has a public tennis court, and we started looking for some gear. That's why when M heard we would be receiving a Pure Drive Roddick Jr. Racquet from Babolat, she was thrilled! When the racquet arrived, it became a daily issue of "when can we go play tennis?". Thankfully, our weather warmed up a little last week; enough so that it was tolerable outside for a little while! Needless to say, we wasted no time in heading over to the park, and trying out the new Pure Drive Roddick Jr.! 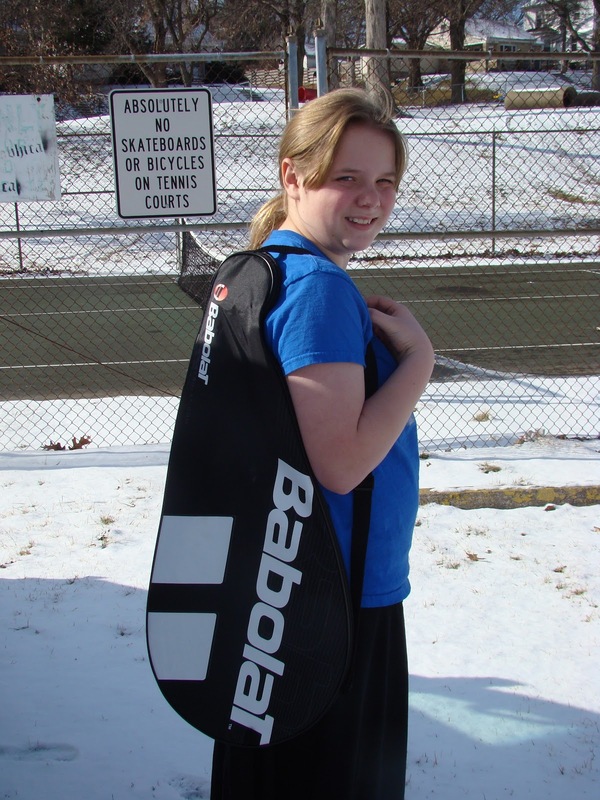 M was very excited, and very proud of her new racquet and case. Due to the still-nippy wind, we only played about 20 minutes or so. However, M caught on very quickly, and really enjoyed playing. I love that she can handle the racquet very easily, and it offers great control for young players. 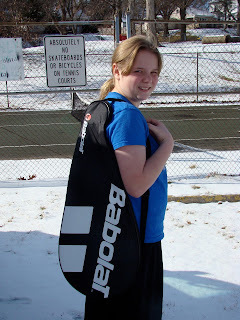 M has been quite insistent about bringing the tennis gear on our trip next month, so we can find some tennis courts in warmer weather (here we come Florida!). It looks like we'll all be getting some exercise on our road trip, with plenty of stops at any tennis courts we can find! One of my readers will receive a Babolat Pure Drive Roddick Jr. Racquet! 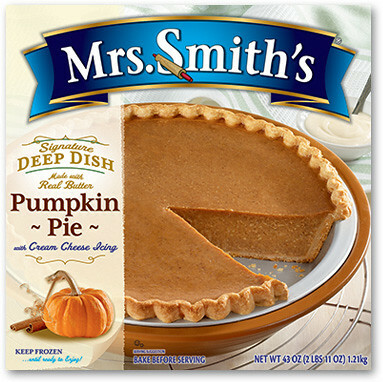 Customize Your Pie With Mrs. Smith's!! Wow! You all know that I love baking...especially when I can take a recipe or favorite dish, and add my own twist on it, to make something even more delicious. So, when I learned about the new Mrs. Smith's Signature Deep Dish pies, that allow you to add your own customization touches, I was thrilled! Don't get me wrong; I enjoy baking from scratch, but there are times when I don't have enough time, or maybe it's just easier to pick up a frozen pie instead of pulling out all the ingredients. There are 4 different pies; Dutch Appl Pie with Caramel Sauce, Cherry Pie with Butter Fudge Sauce, Peach Pie with Cream Cheese Icing, and Pumpkin Pie with Cream Cheese Icing. I would definitely eat any and all of these pies, but my first choice is the Dutch Apple with Caramel Sauce. I love dutch apple pies, and for some reason we don't have them all that often-probably because everyone else prefers cherry over apple! Adding the caramel sauce turns an already-tasty pie into a piece of deliciousness! Then again, I also love pumpkin and cream cheese, so I just might be tempted to try that one as well. This past fall I experimented a lot with pumpkin baked goods and cream cheese icings, and you just can not go wrong with this combination. It is sheer perfection. 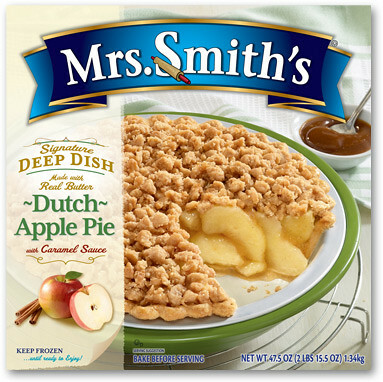 So, next time I'm in a rush, or just don't feel like baking from scratch, I think I'll head to our local grocery store and pick up a Mrs. Smith's Signature Deep Dish Pie! Sounds good right about now, huh? Be sure to follow Mrs. Smith's on Facebook and Pinterest to stay updated on any news (or maybe special coupon offers?)! What Do You Want On Hope's Cafe? Hey all, a while back I had talked about starting a new weekly article on here, sharing a new recipe each week. For some reason I never took off with it, even though many of you said it would be a fun idea. So, what I want to know is, what would you like to see on Hope's Cafe? I want to add something new and fun! Some options I've come up with are the Baking/Cooking/Recipe post idea, interviewing other bloggers, or a recipe swap/hop (which could also be done in conjunction with sharing a recipe). What do you think? Any other ideas? What would you most like to see? Personally, I'm pretty much leaning towards the baking-and-cooking-themed post, and also doing a recipe blog hop type thing, (not sure what the proper term is for that, but basically adding a linky where other bloggers can share their recipe posts) but please let me know what you would most like to see on here! Are any of my readers familiar with the Genie Bra? I've heard a lot of good things about it, but never tried one myself. Recently I learned that they also have something called the Milana Bra, that doubles as a camisole! This ingenious piece has a little lace cover, that offers extra coverage and modesty under your favorite tops. Very cute and feminine too! The neat thing about Genie and Milana, is they are one style fits all. No matter what size you wear in a normal bra, you can find the appropriate match, and have a comfortable bra for any and every day wear. I love that they have no underwire, but provide support with the extra wide band! I also received this news about Genie/Milana, so if you know someone this has affected, please pass on the information! "Have you heard about the petition on Change.org asking Victoria's Secret to make a line for women who've had to have their breasts removed because of cancer? Or, are you perhaps one of the 16,000 that has already signed it? The American Cancer Society’s estimates that there will be approximately 232,340 new cases of invasive breast cancer in women in 2013—which unfortunately means women will continue to endure mastectomy surgeries. Women who have undergone a mastectomy have to deal with many emotional, psychical and psychological issues— finding a bra should be the last thing they need to worry about. Genie understands that, and has developed the Genie Bra and Milana Bra to make women feel confident, strong and beautiful. Offering the one-style-fits-all bra crafted in ever-last comfort stretch fabric with no underwire, no clasps and no seams, Genie makes the ideal everyday undergarment for the woman who has undergone breast surgery. Pockets also allow for the easy use of prosthetics." One of my readers will receive a Milana Bra!! Wow, I am so excited about sharing this product with you all today!! 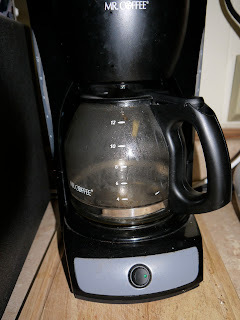 You all know how much I love coffee-it's pretty obvious just from my blog's name, right? Well, although I am a huge coffee fan, I am also very picky about it-I won't drink coffee unless I have creamer, and some flavoring. Whether it's a flavored creamer, syrup flavoring...I need something! And, of course, plenty of sugar or sweetener. I always thought my flavoring options were pretty basic-creamer or syrup. However, when I discovered Inbru, a whole new world of coffee flavors opened up! Using the Inbru, I was able to just add sugar and a splash of milk (yea for saving some calories on the creamer!) and had the perfect flavored coffee! My favorite is the peppermint stick, since I love all things peppermint, but both of them add a nice strong flavor without it being too strong. And of course, you can adjust it to your taste, if you prefer a stronger or less-noticeable flavor. Inbru is my new favorite coffee accessory-or should I say coffee necessity?! 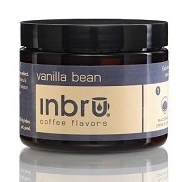 One of my readers will receive 2 Inbru Coffee Flavors!! Beach Feet Australian Boots Warm Your Feet! How's your winter weather? We had some snowfall a few days ago, but unfortunately, most of it is melted already. I say unfortunately because I am really excited about keeping my feet warm and comfy with my new Beach Feet Australian Boots! I received a pair of Beach Feet's Classic Low boots, in a rich brown color. These are sooo cozy, and keep my feet nice and warm when I'm outside, even with our 20-degree weather! 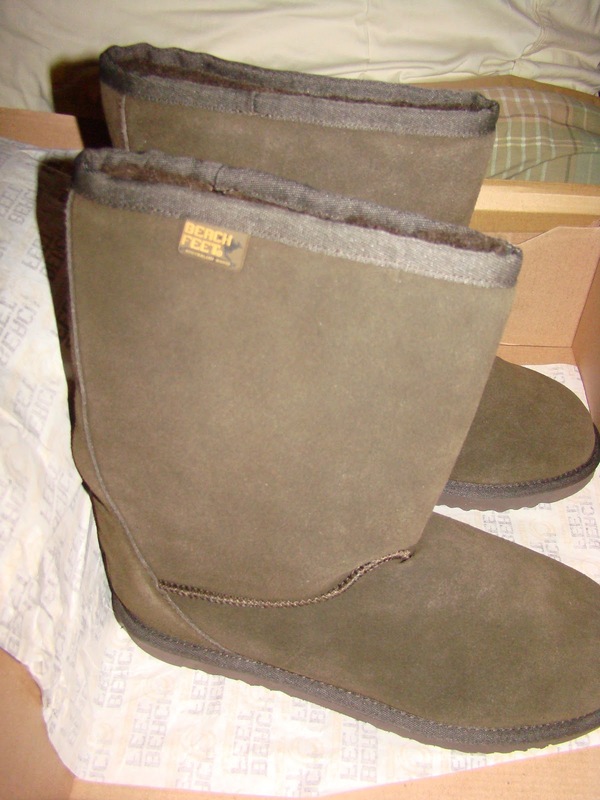 The boots have a soft Australian Merino Wool lining, which matches the chocolate brown of the boots. The lining is literally so soft that you could comfortably wear these without socks, and feel like you're wearing slippers! What I really love though, is that even though these are practical, and the best winter boots I've worn, they also look stylish, and perfectly complement just about any style. I generally run around in denim, and it looks great with my Beach Feet boots. The sizing is true to size, which means you can order from Beach Feet without any stress over ending up with boots that are too tight or too big. They slip on; there's no ties or zippers, so you can easily slip into your boots whenever you need head outside. Whether it's for running around town, or to walk the dogs, I can walk in comfort, style and warmth with Beach Feet! The Classic Low Boots from Beach Feet are quality at an affordable price! Disclaimer: I was not monetarily compensated in any way for this review; I did receive product for the purpose of review. All thoughts and opinions are mine; all quotes taken from the Beach Feet website. I was not required to post favorably about the product or company. Great For God-A Great Book!! ShaveTech Travel Razor Is Great!! Portable Solar Power?! Yes Please!! Reflections Hair Care Pack Review and #Giveaway!! Get Your Style On With No nonsense Leggings!